Massachusetts Gov. Charlie Baker and Lieutenant Governor Karyn Polito announced a plan to end youth homelessness in the Commonwealth Thursday at Framingham State University. The Baker-Polito administration joined officials in the education and housing communities to fund local providers and create a new housing pilot program. The plan grants $3 million in funding to 10 community providers, each allocating their funds to a region of Massachusetts. A Voices of Youth Count national survey conducted by Chapin Hall estimates that in the United States, there are up to 4.2 million unaccompanied youth experiencing homelessness. According to the plan, at least 1,800 young adults experience homelessness in Massachusetts each year. Homeless youth living in Boston may be relocated outside the city in order to find affordable housing. According to the plan, Boston-area drop-in centers and youth and young adult shelters shelters reported having to send young adults outside of the city in order to obtain affordable housing. Marylou Sudders, secretary of the Executive Office of Health and Human Services and co-chair of the Interagency Council on Housing and Homelessness, said in the press release that the $3 million in funding will provide youth and young adults with the support they need. John Yazwinski, CEO of Father Bill’s and Mainspring, one of the organizations receiving funding from this plan, said that the main objective is to be a flexible source of support for homeless youth. Yazwinski also stressed the importance of not allowing the current youth population in Massachusetts to become a chronic homeless population in the future. “We don’t want that to happen to this population, to be stuck without getting a good education, without getting opportunities in the workforce for job training because they’re struggling with homelessness at this point,” Yazwinski said. Bridge Over Troubled Waters is receiving a $325,000 grant to cover the Boston metro area. Bridge Executive Director Elizabeth Jackson said the organization is partnering with six agencies to distribute the money to them. Jackson also said that the support homeless youth receive should be individualized, as not all youth experience the same circumstances. The Massachusetts Student Housing Security Pilot plans to provide homeless students attending community colleges with dorm rooms. 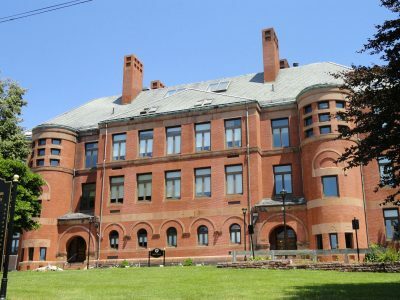 According to a release from Baker and Polito, each of these universities “will make up to five beds available for students experiencing homelessness or housing insecurity” as well as provide meals. The campuses will be reimbursed by the state. “We are hopeful this housing pilot will provide a stable place for students to live so they can thrive academically, obtain their degrees, and change their lives,” Peyser said. Boston University spokesperson Colin Riley said that he thinks homelessness with college students has gotten attention because of the way it is impacting students. Joshua Martin, a freshman in the College of Communication, said he supports the program. Michael Montenegro, a freshman in Questrom School of Business, said that he thinks that providing free housing to homeless students could be beneficial to lots of people.